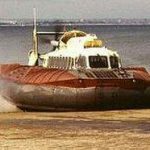 Today in Gosport‘s Past:- on 24 July 1965, the Hovertravel hovercraft service between Stokes Bay and Ryde, and Southsea to Ryde, began, using the Westland SR-N6 hovercraft. 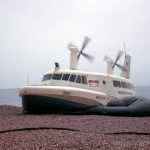 The two routes were the very first ‘successful’ public hovercraft services anywhere in the world, exactly 51 years ago. 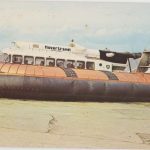 Sadly, the Stokes Bay service didn’t fare as well as the Southsea operation, and services ended on 28 September 1968, possibly to the relief of local residents in Gomer & Alverstoke (it WAS very noisy!). 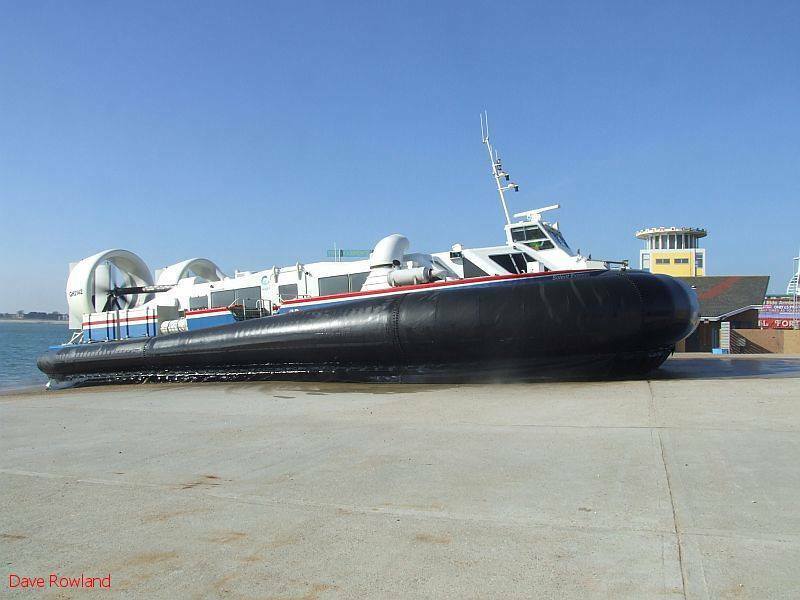 Of course, the Southsea-Ryde route blossomed, and is still popular today – the only remaining public hovercraft service in Europe. 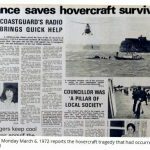 On Saturday 4 March 1972, one of the hovercraft overturned in rough weather 400 yards off Southsea, resulting in 5 fatalities; the newspaper clipping is from the Portsmouth Evening News of Monday 6 March 1972. Credits to original photographers. 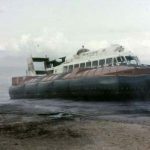 Also Today in Gosport’s Past:- on 24 July 1987, Gosport’s long relationship with TS “Foudroyant” ended when the ship was loaded onto a large barge, and towed to Hartlepool, never to return. 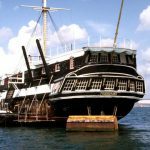 The ‘Leda’ Class frigate was ordered on 30 October 1812 from the Wadia Shipyards Co, Bombay, India; owing to a shortage of oak, the ship was built of teak, named HMS “Trincomalee”and launched on 12 October 1817, having cost some £23,000. 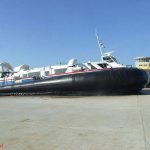 There had been a delay of around a year, as the ship carrying the plans for the class had been captured by the Americans, and another ship was despatched with replacement plans. 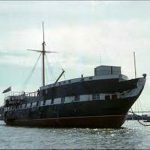 After being completed, the ship sailed to Portsmouth, arriving on 30th April 1819, the trip having cost a further £6,600. 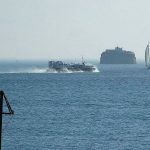 “Trincomalee” recieved further fitting out (cost £2,400), she was placed in reserve until 1845, when armament was reduced, but giving greater fire power, the stern was altered, and she was reclassified as a sixth-rate spar-decked corvette. 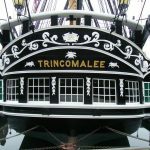 HMS “Trincomalee” departed from Portsmouth in 1847, and served on the North America & West Indies station. 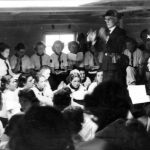 Riots were dealt with in Haiti, and an invasion of Cuba was avoided, and the ship served on anti-slavery patrols. Thence to Newfoundland and Labrador before being recalled to Portsmouth in 1850. 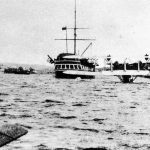 Left again in 1852 to join the Pacific Squadron on America’s west coast. 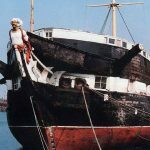 After returning home, she found use as a training ship until being placed in reserve again in 1895, and was sold for scrap on 19 May 1897 to a Portsmouth scrap dealer. 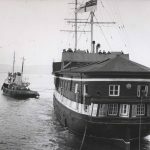 Luckily, entrepreneur George Wheatley Cobb saw the potential in the ship, and purchased her for use again as an accomodation ship, a training ship, and a holiday ship. 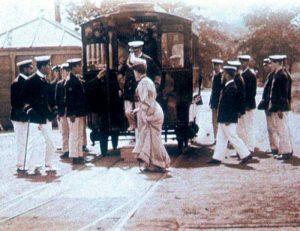 She was renamed TS “Foudroyant” in honour of HMS “Foudroyant”, which had been wrecked at Blackpool in 1897. 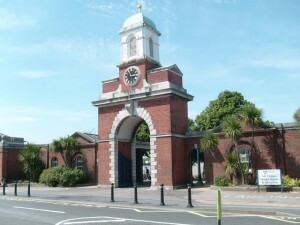 Initially, this position was in Falmouth, Cornwall, but was moved to Gosport at an unknown date c.1932, and moored off Hardway. 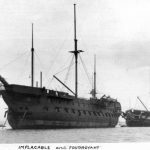 During this period, “Foudroyant” was moored immediately astern of HMS “Implacable”, and they served the same purpose as one establishment. 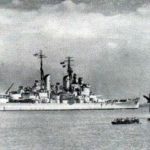 In World War 2, “Foudroyant” and “Implacable” were recommissioned together as HMS “Foudroyant”, performing the same tasks. 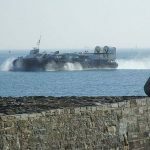 After the war, the ‘HMS’ became ‘TS’ again; HMS “Implacable”, despite efforts to preserve the Royal Navy’s oldest floating ship, funds weren’t available, and she was towed to 4 miles off Ventnor and blown up, with full honours (!!!) 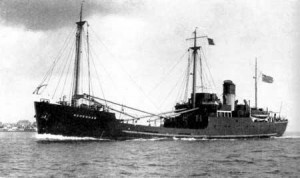 on 2 December 1949. 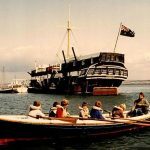 After a while, TS “Foudroyant” was given a new location, being moored near Haslar, where HMS “St Vincent” had been moored from 1870 to 1905. 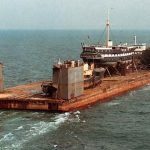 Her final position was near Rat Island, where she remained as a training ship for youngsters until the facility ended in 1986, and the move to Hartlepool was undertaken in July 1987. 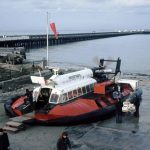 The story doesn’t end there though; since arrival at Hartlepool she has been superbly restored to her original condition; and is a great credit to all involved in the restoration work and constant upkeep. 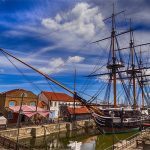 Now, as HMS “Trincomalee”, she is on public display at Hartlepool, and is still afloat; in fact, she is the oldest Royal Navy warship still afloat, and the only older warship still afloat anywhere in the world is USS “Constitution”. 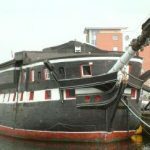 A sister ship of HMS “Trincomalee”, HMS “Unicorn” (1824), is preserved as a museum ship in Dundee, but rather as a hulk, like “Foudroyant” was at Gosport; the ship never recieved rigging. Credits to original photographers.